Home » Self Pack Removal » What Size Container would I need? The first question most people have is: What size container will need to store all my goods? There is no hard and fast answer to this question unfortunately, however there are a few guidelines to use to find roughly the right size for you. Generally, a 20 foot shipping container generally has enough space for a three bedroom home to be packed up. Alternatively, it will fit a car and some household items. 40ft shipping containers are normally needed to fit all the items in that make up a 4-5 bedroom home or a car and the items in a two bedroom home. There are a lot of variables to take into account – including furniture. A great suggestion is to consider loading your moving container like a game of Tetris. Rather than just loading things in randomly as they are packed, take some time to consider how all of your belongings (particularly the larger items) are going to fit in the moving container and in what order. 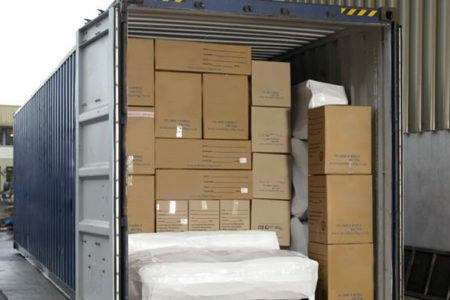 It’s a good idea to pack large and heavy furniture items around the back and sides of the container so they can be secured directly to the walls of the container. Remember that what goes in first is last to be unpacked so it’s useful to keep essential items as one of the last things packed. When you have tied in large or oddly shaped pieces of furniture in the container, don’t forget to utilise any empty space that they create by filling cavities – such as between chair legs – with smaller items. The more that you fill all of these odd little spaces, the more secure your container load will be with less chance of movement. (Don’t attempt to fill these spaces until the large items are packed in the container. Filling drawers, book shelves etc. before loading will make your furniture too heavy and unsafe to move).